Meteorites are solid pieces of debris from an object from outer space, such as a comet, asteroid, or meteoroid. A meteorite survives its passage through the Earth's atmosphere and impact with the Earth's surface. Most meteorites are thought to originate from the asteroid belt between Mars and Jupiter. Some think that the astseroid belt was once a planet which got desstroyed through impact with a much larger body and fragmented into what we now call asteroids. As many meteorites contain iron, it is only those that fall in dry rainfree places like deserts that survive the longest. Those that fall in the oceans or in very rainy places last less due to weathering. Examples of famous meteorites are the Sikhote Alin in the former USSR and the Gibeon meteorite that fell in Namibia, Africa. Opinion varies on the healing properties of meteorites. Some healers say it has no healing energy whatsoever while others think meteorites increase the chi flow through the meridian system of the body and protect the aura from negative energy. 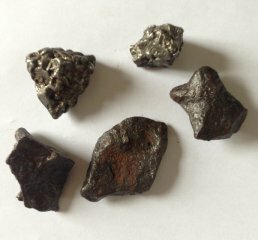 Meteorites are said to amplify telepathic activity, opening up awareness and connection to extraterrestrial life forms. Meteorites are associated with the outer planets Uranus, Neptune and Pluto. Meteorite is said to activate Ajna, The Third Eye Chakra ( 6 ). Sikote Alyne Meteorite. Interesting smooth and tactile piece. Location: Sikote Alyne, Russia, fell september 1947. Dimensions: 4 x 1.9 x 1.5 cm. Sikote Alyne Meteorite. Dense, smooth and tactile piece. Location: Sikote Alyne, Russia, fell september 1947. Dimensions: 3.4 x 3.7 x 1.1 cm.